1 D None No Power Seat 1 D is an Economy Class Bulkhead seat that may have limited legroom due to the position of the bulkhead. The proximity to the lavatory and galley may be bothersome. The tray table is in the armrest, making the armrest immovable and slightly reducing seat width. This seat also has an immovable aisle-side armrest, so both armrests are immovable. There is no floor storage for this seat during take-off or landing. 1 E None No Power Seat 1 E is an Economy Class Bulkhead seat that may have limited legroom due to the position of the bulkhead. The proximity to the lavatory and galley may be bothersome. The tray table is in the armrest, making the armrest immovable and slightly reducing seat width. There is no floor storage during takeoff and landing. 1 F None No Power Seat 1 F is an Economy Class Bulkhead seat that may have limited legroom due to the position of the bulkhead. This seat is narrower than others on the plane. The proximity to the lavatory and galley may be bothersome. The tray table is in the armrest, making the armrest immovable and slightly reducing seat width. There is no floor storage during takeoff and landing. 10 A None No Power Seat 10 A is an Economy Class seat that is missing a window. 11 A None No Power Seat 11 A is an Economy Class seat that has a misaligned window. 11 F None No Power Seat 11 F is an Economy Class seat that has a misaligned window. 14 A None No Power Seat 14 A is an Economy Class seat that may have limited or no recline due to the Exit Row behind. 14 B None No Power Seat 14 B is an Economy Class seat that may have limited or no recline due to the Exit Row behind. 14 C None No Power Seat 14 C is an Economy Class seat that may have limited or no recline due to the Exit Row behind. This seat has an immovable aisle-side armrest. 14 D None No Power Seat 14 D is an Economy Class seat that may have limited or no recline due to the Exit Row behind. This seat has an immovable aisle-side armrest. 14 E None No Power Seat 14 E is an Economy Class seat that may have limited or no recline due to the Exit Row behind. 14 F None No Power Seat 14 F is an Economy Class seat that may have limited or no recline due to the Exit Row behind. 15 A None No Power Seat 15 A is an Economy Class Exit Row seat with extra legroom that may have limited or no recline due to the Exit Row behind. There is no window side armrest due to the emergency exit, which some may find bothersome. The tray table is in the armrest, making the armrest immovable and slightly reducing seat width. There is no floor storage for this seat during take-off or landing. 15 B None No Power Seat 15 B is an Economy Class Exit Row seat with extra legroom that may have limited or no recline due to the Exit Row behind. There is no window side armrest due to the emergency exit, which some may find bothersome. The tray table is in the armrest, making the armrest immovable and slightly reducing seat width. There is no floor storage for this seat during take-off or landing. 15 C None No Power Seat 15 C is an Economy Class Exit Row seat with extra legroom that may have limited or no recline due to the Exit Row behind. The tray table is in the armrest, making the armrest immovable and slightly reducing seat width. This seat also has an immovable aisle-side armrest, so both armrests are immovable. There is no floor storage for this seat during take-off or landing. 15 D None No Power Seat 15 D is an Economy Class Exit Row seat with extra legroom that may have limited or no recline due to the Exit Row behind. The tray table is in the armrest, making the armrest immovable and slightly reducing seat width. This seat also has an immovable aisle-side armrest, so both armrests are immovable. There is no floor storage for this seat during take-off or landing. 15 E None No Power Seat 15 E is an Economy Class Exit Row seat with extra legroom that may have limited or no recline due to the Exit Row behind. There is no window side armrest due to the emergency exit, which some may find bothersome. The tray table is in the armrest, making the armrest immovable and slightly reducing seat width. There is no floor storage for this seat during take-off or landing. 15 F None No Power Seat 15 F is an Economy Class Exit Row seat with extra legroom that may have limited or no recline due to the Exit Row behind. There is no window side armrest due to the emergency exit, which some may find bothersome. The tray table is in the armrest, making the armrest immovable and slightly reducing seat width. There is no floor storage for this seat during take-off or landing. 16 B None No Power Seat 16 B is an Economy Class Exit Row seat that has no extra legroom and limited recline. The tray table is in the armrest, making the armrest immovable and slightly reducing seat width. There is no floor storage for this seat during takeoff and landing. The seats in this row are preferred by passengers traveling in couple since the absence of a third seat on each side offers more privacy. 16 C None No Power Seat 16 C is an Economy Class Exit Row seat that has no extra legroom and limited recline. The tray table is in the armrest, making the armrest immovable and slightly reducing seat width. This seat also has an immovable aisle-side armrest, so both armrests are immovable. There is no floor storage for this seat during take-off or landing. The seats in this row are preferred by passengers traveling in couple since the absence of a third seat on each side offers more privacy. 16 D None No Power Seat 16 D is an Economy Class Exit Row seat that has no extra legroom and limited recline. The tray table is in the armrest, making the armrest immovable and slightly reducing seat width. This seat also has an immovable aisle-side armrest, so both armrests are immovable. There is no floor storage for this seat during take-off or landing. The seats in this row are preferred by passengers traveling in couple since the absence of a third seat on each side offers more privacy. 16 E None No Power Seat 16 E is an Economy Class Exit Row seat that has no extra legroom and limited recline. The tray table is in the armrest, making the armrest immovable and slightly reducing seat width. There is no floor storage for this seat during takeoff and landing. The seats in this row are preferred by passengers traveling in couple since the absence of a third seat on each side offers more privacy. 17 A None No Power Seat 17 A is an Economy Class Exit Row seat that has extra legroom since there is no seat directly in front of it. The tray table is in the armrest, making the armrests immovable and slightly reducing seat width. There is no floor storage for this seat during takeoff and landing. 17 B None No Power Seat 17 B is an Economy Class Exit Row seat that offers no extra legroom. The tray table is in the armrest, slightly reducing seat width. There is no floor storage for this seat during takeoff and landing. 17 C None No Power Seat 17 C is an Economy Class Exit Row seat that offers no extra legroom. The tray table is in the armrest, slightly reducing seat width. There is no floor storage for this seat during takeoff and landing. 17 D None No Power Seat 17 D is an Economy Class Exit Row seat that offers no extra legroom. The tray table is in the armrest, slightly reducing seat width. There is no floor storage for this seat during takeoff and landing. 17 E None No Power Seat 17 E is an Economy Class Exit Row seat that offers no extra legroom. The tray table is in the armrest, slightly reducing seat width. There is no floor storage for this seat during takeoff and landing. 17 F None No Power Seat 17 F is an Economy Class Exit Row seat that offers no extra legroom. The tray table is in the armrest, slightly reducing seat width. There is no floor storage for this seat during takeoff and landing. 2 A None No Power Seat 2 A is an Economy Class Bulkhead seat that has extra legroom due to the position of the bulkhead. This seat has an immovable aisle-side armrest and is narrower than other seats on the plane. The proximity to the lavatory and galley may be bothersome. The tray table is in the armrest, making the armrest immovable and slightly reducing seat width. There is no floor storage during takeoff and landing. 2 B None No Power Seat 2 B is an Economy Class Bulkhead seat that has extra legroom due to the position of the bulkhead. The proximity to the lavatory and galley may be bothersome. The tray table is in the armrest, making the armrest immovable and slightly reducing seat width. There is no floor storage during takeoff and landing. 2 C None No Power Seat 2 C is an Economy Class Bulkhead seat that has extra legroom due to the position of the bulkhead. The proximity to the lavatory and galley may be bothersome. The tray table is in the armrest, making the armrest immovable and slightly reducing seat width. This seat also has an immovable aisle-side armrest, so both armrests are immovable. There is no floor storage for this seat during take-off or landing. 2 D None No Power Seat 2 D is a standard Economy Class seat. However, the proximity to the lavatory may be bothersome. 2 F None No Power Seat 2 F is an Economy Class seat that is narrower than other seats on the plane. 30 B None No Power Seat 30 B is an Economy Class seat that is narrower than others on this plane. 30 E None No Power Seat 30 E is an Economy Class seat that is narrower than others on this plane. 31 C None No Power Seat 31 C is a standard Economy Class seat. However, the proximity to the lavatory may be bothersome. 31 D None No Power Seat 31 D is a standard Economy Class seat. However, the proximity to the lavatory may be bothersome. 32 A None No Power Seat 32 A is an Economy Class seat located in the last row of the plane. This seat may have limited recline due to the lavatory wall immediately behind. The proximity to the lavatory and galley may be bothersome. Also, you will be among the last passengers to deplane upon arrival. 32 B None No Power Seat 32 B is an Economy Class seat located in the last row of the plane. This seat may have limited recline due to the lavatory wall immediately behind. This seat is narrower than others on this plane. The proximity to the lavatory and galley may be bothersome. Also, you will be among the last passengers to deplane upon arrival. 32 C None No Power Seat 32 C is an Economy Class seat located in the last row of the plane. This seat may have limited recline due to the lavatory wall immediately behind. The proximity to the lavatory and galley may be bothersome. Also, you will be among the last passengers to deplane upon arrival. 32 D None No Power Seat 32 D is an Economy Class seat located in the last row of the plane. This seat may have limited recline due to the lavatory wall immediately behind. The proximity to the lavatory and galley may be bothersome. Also, you will be among the last passengers to deplane upon arrival. 32 E None No Power Seat 32 E is an Economy Class seat located in the last row of the plane. This seat may have limited recline due to the lavatory wall immediately behind. This seat is narrower than others on this plane. The proximity to the lavatory and galley may be bothersome. Also, you will be among the last passengers to deplane upon arrival. 32 F None No Power Seat 32 F is an Economy Class seat located in the last row of the plane. This seat may have limited recline due to the lavatory wall immediately behind. The proximity to the lavatory and galley may be bothersome. Also, you will be among the last passengers to deplane upon arrival. 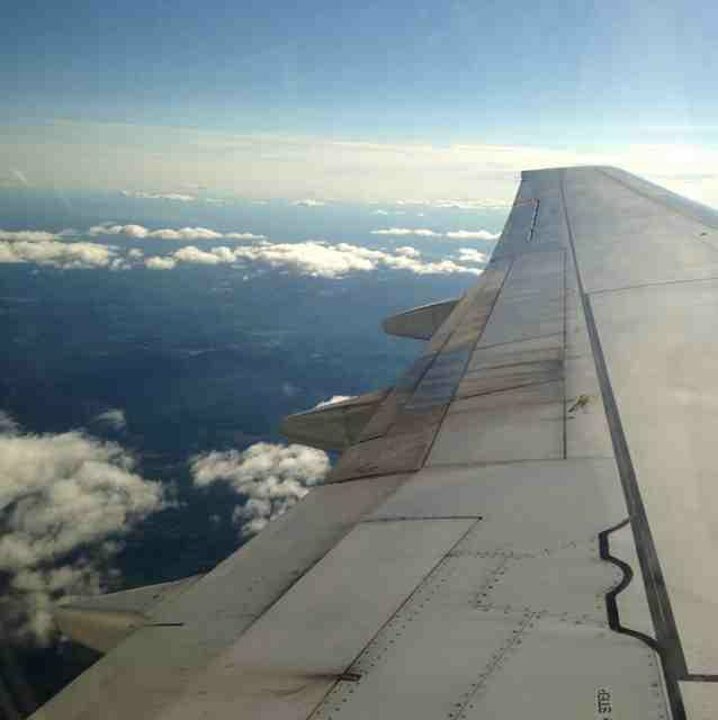 Wi-Fi is available on select 737-800 aircraft in the SAS fleet. 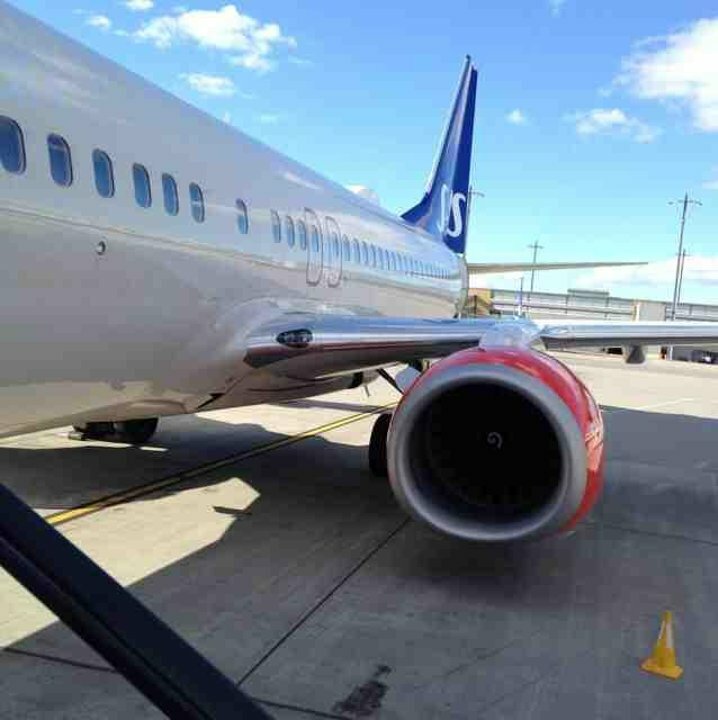 SAS flies the Boeing 737-800 in three different configurations. This version has 181 seats in a one-class configuration of Economy. I paid extra for emergency row seat 15E. All of the economy seats on this plane are much too narrow. My shoulders overlapped with the guy next to me. One of us had to lean forward in the seat to allow for the other's shoulder. Both of us are average sized males. The seats are so narrow as to forbid turning a little sideways to allow for more shoulder room. I paid extra for this seat. I was completely disappointed with this seat. VERY UNCOMFORTABLE. Best seat ever. Next to nice window, emergency exit and as the seat in front of you is removed, you have heaps of space for your legs. Pleasantly surprised. I have been avoiding SAS save for trans Atlantic flights because I though their planes were uncomfortable. Not the case. 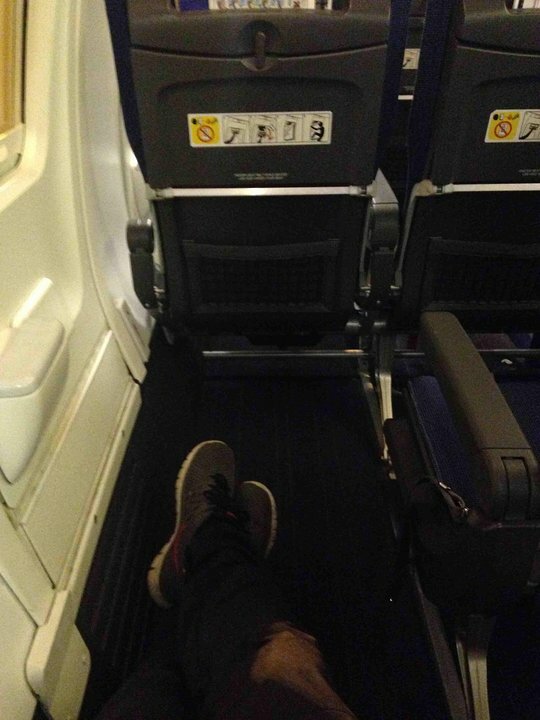 Granted, this was a short hop from BGO to OSL and the plane wasn't full but even at 6'6", I had enough leg room. Service was decent given the short amount of time in the air. Old tired planes that are in desperate need for an upgrade. Narrow seats, although ok leg room. 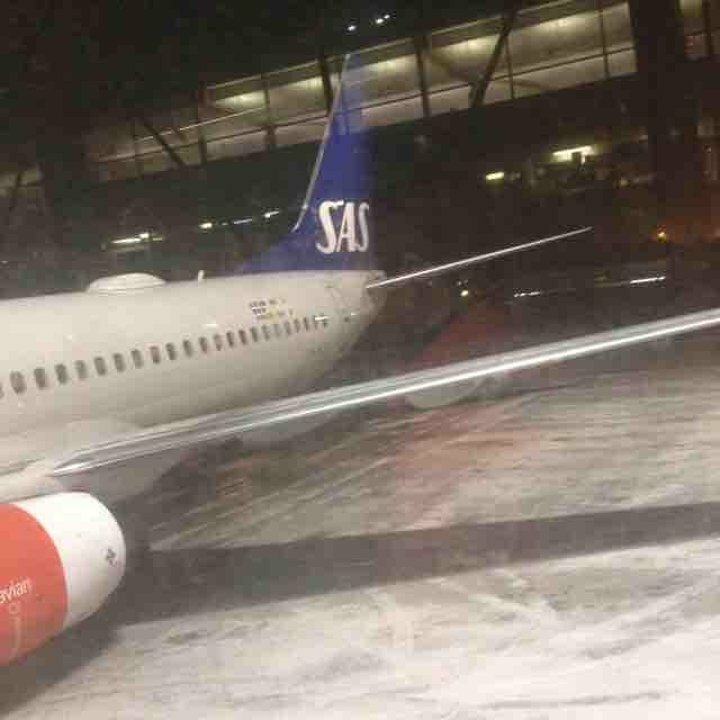 SAS Plus gets you a meal on the plane, but it's likely to be cold food, even if it's a cooked meal. Breakfast was rubbish, although lunch carrying on, on the same plane, was mostly edible. 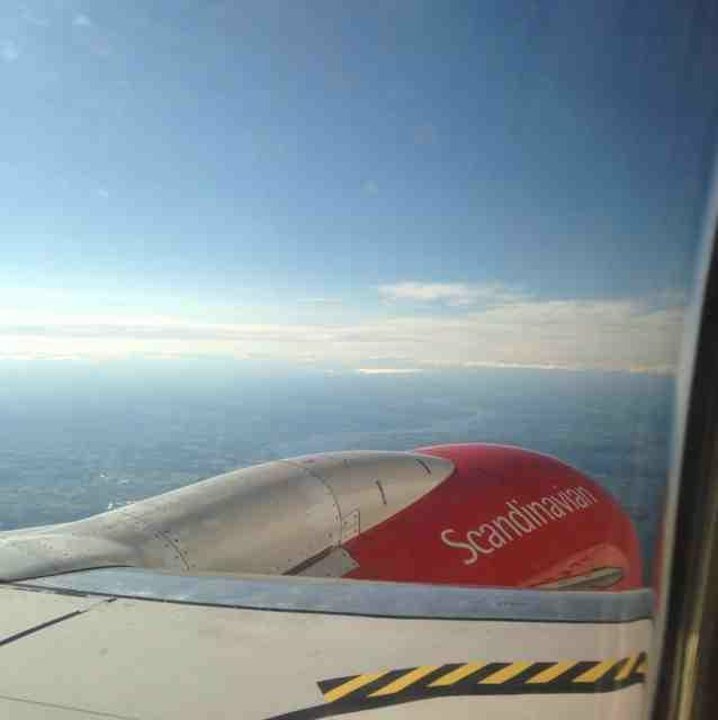 Staff isn't very friendly and seem to ignore passengers that don't speak a Scandinavian language. Not an airline I'd go out of my way to fly with. Seat does have a hole in the wall that does allow for extra legspace. However the seat itself is not very comfortable. Very tight to the sides, small shared armrests. Aisle seats have less storage for bags under the seat in front than middle and window seats. The window for this seat is slightly misaligned, and there is reduced place in the shoulder area due to the misaligned window. Regular seat in the 737, nice feature is that this seat has two windows. There is extra legroom in this seat!!! Just as it is in seat 17A. Uncomfortable seats with very hard backs. Only one offer of tea/coffee on a 3 hour flight. Nothing else free at all. Probably one of the worst economy cabins i have been in. Seats are like cardcoard, stiff small and hard. Im not a tall guy at all (5'9) and my knees were on the seat in front of me. For cheap flights around Europe you put up with it. Wish there was more selection other than free coffee or tea served. There is lots of extra legroom for this seat, since seat 16F is missing due to the emergency exit. SAS flies 1 versions of Boeing 737-800 (738).